Clarissa Darling of '90s sitcom "Clarissa Explains It All," has given us the 411 on everything from pimples to training bras to annoying little brothers. Now she's taking on a somewhat more complex concept: white supremacy. 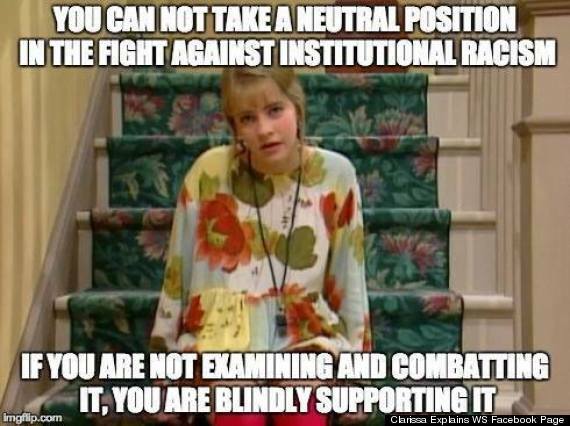 The Facebook page "Clarissa Explains WS," created in December, breaks down the concept of white supremacy using Clarissa from '90s TV show "Clarissa Explains It All" in memes. In light of the recent deaths of multiple unarmed black men including Michael Brown, Eric Garner, Tamir Rice and Akai Gurley at the hands of police, and the bombing of an NAACP headquarters in Colorado on Jan. 6, the topic is more important than ever. The Huffington Post spoke with the creator of the page, a higher education teacher, who asked to remain anonymous. The teacher explained that the memes came about as "somewhat of an accident" when the creator and a student were working on a project to teach people about white supremacy and the role police play in it. "We were struggling with the concept of conveying these key ideas in a succinct and accessible way," the creator told HuffPost. "We joked about having Clarissa explaining it to everyone and I started the page later that day." 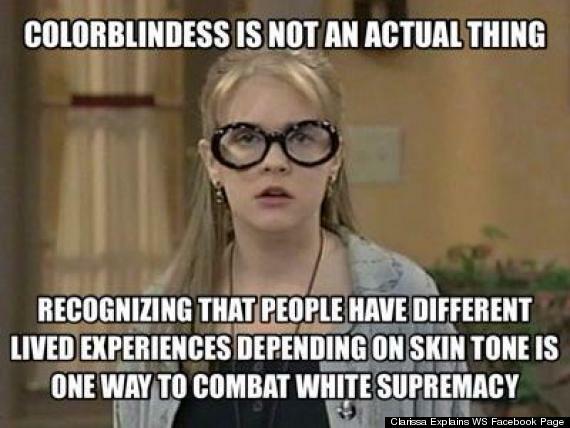 The memes cover color blindness, the choice to take a "neutral position" on race and the media's representation of racism in the U.S. The creator explained why they chose to focus on "white supremacy" instead of using the terms white privilege or racism, saying, "The discussion of white privilege leads to white people talking about their feelings. The discussion of white supremacy leads to addressing the white supremacist system." White supremacy is a type of systematic discrimination, separate from the intentions of individuals. "We can argue all day about a police officer's true intentions and if he really is a racist, or we can say he is enacting state violence in defense of white supremacy," the page's creator said. "There is no proving his true intentions, what we can prove is that he is part of a system and enacting state violence." While the page's creator noted that Melissa Joan Hart is an "ironic" pick to explain these subjects due to Hart's past run-ins with racial profiling, "it's also accessible in a way because most people that grew up with the show already have the context that she explains things." 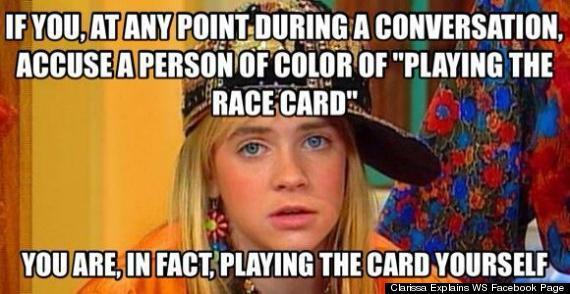 The creator also explained that they chose Clarissa -- a white cultural figure -- intentionally, to target white people. Don't remember this one? There might be a reason for that. Read about it here. "My hopes are that the irony makes the memes easier for people to share on their timelines," the creator said. "The concepts are often super challenging to grasp and convey and they can be hard to talk about for a lot of people. Its a super serious topic to be sure but I'm excited to see them being shared because this stuff needs to be said and reinforced as much as possible." Yes, yes and more yes. Still confused? Read this.